David Begbie ARBS, acknowledged for his unique and highly original sculpture in steelmesh has been commissioned by the New Millennium Experience Company to produce an image to embrace all faiths and to symbolise the unity of all spiritual and temporal beginnings. The child image based on a real life model appears at the entrance to the zone and again at the end. Begbie has exhibited widely throughout the world, including exhibitions this year in Amsterdam, Guernsey, Hamburg, USA and Canada. He is working on a number of other Millennium projects, in particular the conceptual centrepiece for Bede’s world in Newcastle and a project for St Mary-the-Less at Chilbolton. His work can often be seen first at Gallery Differentiate in Butler’s Wharf near the Design Museum. 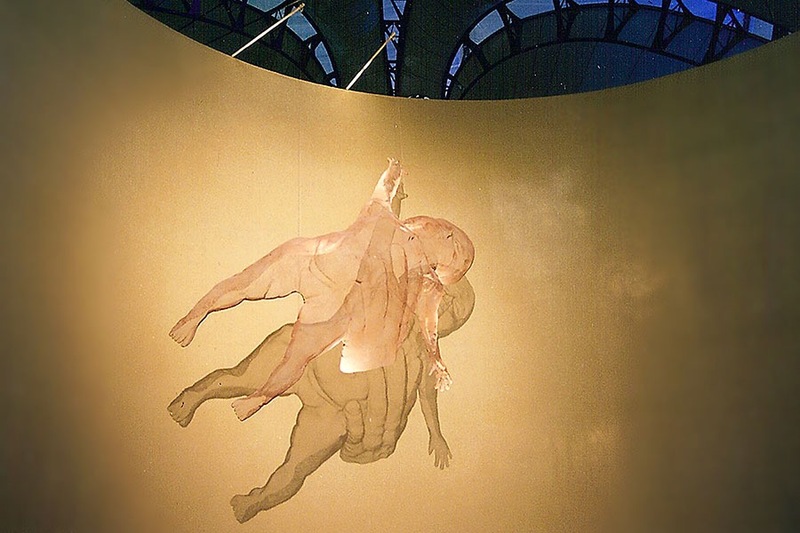 A huge transparent sculpture of a new born baby is suspended as if floating at the entrance to the Faith zone. The fragility of life, vulnerability of the human form, helplessness and reliance on a greater power and much more are encapsulated in this amazing piece of art. David Begbie has captured the moment of independent new life. A moment of wonder, innocence and unrestricted promise and potential unmarred by passions or prejudice. A moment which is happening every hour of every day in every part of the world. A moment which is universal and unites us all in a common experience. It is fitting that this image should commence our spiritual journey through the zone which charts our progress from dependent child through milestones of adult life to the end of life and appears again as a symbol of our onward journey, though this time more intimate and accessible in scale. David Begbie is known for his works portraying the adult form. His renditions of the human body using his unusual medium produces sensual and evocative images which are complimented and enhanced by their projected shadows which have an almost photographic quality. Begbie has previously worked with spiritual themes such as “crucifix” installed in Winchester Cathedral in 1988, a corporate commission for two large scale angels, “Anangel” and “Manangel” installed earlier this year in the Jam House, Birmingham as well as a variety of smaller works. Grace was born on Saturday 19th June 1999 10 weeks premature and weighing only 2.7 lbs. She spent the first 6 weeks and four days of her life in the Special Care Baby Unit at Harrold Wood Hospital in Essex. During the first few days her life lay in the balance and she required round the clock care. Her mother, Kirsty, was unable even to see her daughter for three days as she herself was in Intensive Care in another hospital. Grace had been born by emergency caesarean when Kirsty collapsed suddenly at home with eclampsia, a life threatening condition caused by high blood pressure . It was necessary to risk the extremely premature delivery in order to save Kirsty’s life. Grace is the baby on whom the sculpture “Faith” is based.